Murals commemorate the forces and their horses who served in World War One. 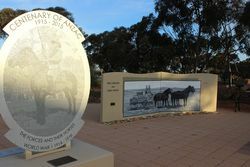 Funding was received through the ANZAC Centenary Grants Program. The project was a ‘concept’ driven by Mrs Barbara Dinnie titled, ‘The Forces and their Horses in the First World War’, whcih produced a series of murals that commemorate the Forces and their Horses in World War One. Construction of 5 concrete walls features a selection of murals painted by artist Irene Osborne that represents the support that the Light Horses had to the Forces. These walls are erected in close proximity to the past and present Pioneers wall on the main street of Dalwallinu. The Shire has contributed the shortfall in funds.